When summer arrives, it feels like everyone around us is popping on shorts, lighting up the BBQ, and inviting the neighbours round for Pimm’s. People seem lighter and brighter when the sun comes out. But for many of us that’s not the case. The sun doesn’t send our mental illness a memo asking it to kindly leave us alone. Depression has a nasty habit of lingering around whatever the weather. In this post, we outline some problems that can arise at this time of year – and suggest some ways we can manage them. Heat can be an issue for many of us. It can feel claustrophobic, it can give us headaches, it can feel hard to breathe. Heatwaves are more likely to affect those with serious mental health problems. We need to make sure we stay hydrated because dehydration can have an impact on how we’re feeling. The usual heat management advice applies: loose clothing, sun cream, sticking to shady areas, cool showers, and open windows. Sleep affects our mood and depression can cause us to sleep too much or not enough. If we already struggle to sleep, the longer days and shorter nights don’t help. Going to bed when it’s light can make it hard to get to sleep. The sun rising early can wake us up at an uncivilised hour. This combination can throw our sleep schedule out of whack which can have a knock-on effect on our mood. Trying to stick to roughly similar bedtimes, even if we don’t sleep, can help our sleep routine. If we can’t sleep, we could sit in bed reading, watching TV, or doing something else which is low-energy and relaxing. Black-out blinds can be helpful for the light issue as they block out more light than normal curtains. If we can’t install these, hanging blankets or towels over the top of existing curtains (paying attention to the tops and bottoms where the most light gets in) can help – as can taping newspaper onto the windows (yes, really!). As an alternative we could try wearing an eye mask when we sleep. When it’s hot, often we feel less hungry than normal. We also don’t want to stand in a hot kitchen cooking. Depression can affect our appetite even when it’s not hot – and the heat can make it worse. Food can have a real impact on our mood. So, it’s important that we try and keep a balanced diet, even if we don’t feel like eating or cooking. Sticking to a meal plan can help because it takes the thought out of meals each day. When we’re already hot and bothered, the last thing we need is to have to make decisions as well as cooking. We don’t have to always eat hot food, either. We can stick to cold things like salads. We can batch-cook things like pasta or potatoes and leave them in the fridge, saving us from cooking each night. For an extra cooling kick, we could try freezing things like smoothies or yoghurt in ice lolly moulds. When the sun comes out, the number of layers we wear tends to reduce. It can feel exposing – almost as if a barrier between us and the world has been removed. Wearing fewer clothes can bring up body image worries – which can be especially pronounced when we’re depressed due to low self-esteem. In an ideal world, no-one would feel shame about their bodies. People come in all shapes and sizes, and there is *so* much more to us than how we look. But the sad truth is that most people have worries about their body in one form or another; it seems like human nature to obsess over our so-called ‘faults’. To help boost our self-esteem, investing in summer clothes that make us feel good can be a short-term fix (though we appreciate that many of us find shopping stressful and demoralising). Looking longer term, focusing on what we like about our bodies – and celebrating what our bodies do for us can improve the way we see ourselves. For inspiration, check out the online Body Positivity movement (Bodyposipanda is our fav!). Wearing fewer clothes can also be an issue for those of us who . Again, we shouldn’t need to feel ashamed of any scarring (they’re signs of our fight to survive after all) – but with the stigma around self-injury this isn’t always possible. Products like bio-oil can reduce the visibility of scars, as can applying make up. If we choose to cover up, we can wear long loose clothing over the affected areas – lighter colours are cooler than darker ones. It’s worth remembering that scar tissue can be especially susceptible to burning so sun cream is a must. If we do struggle with urges to harm ourselves, these distraction techniques can help. When the sun comes out, the ‘shoulds’ often come with them. Sometimes, we want to sit inside watching a film but feel like we ‘should’ be outside making the most of the sunshine. Social events tend to happen more often and we feel like we ‘should’ attend. It can make us feel rubbish. We often skip doing something we want to do, or need to do, in favour of something that we ‘should’ be doing. Even if we do say no to doing something, we can struggle to relax because the ‘shoulds’ are whizzing around our head. The sun coming out doesn’t mean that our depression will magically disappear. We still need to set boundaries, we still need to say no to things that are likely to be unhelpful. We still need to set time aside to practice self-care. If what we need is to watch a film and relax, there’s no harm in doing so even if the sun is shining. We’re not wasting the day or wasting the weather. We’re looking after ourselves (and the sun will shine another day!). Having a routine can help with depression. Over the summer, our carefully constructed routines can go out of the window. Our kids don’t have to be at school for 9am every day, and might stay up later. We might take some time off work and quickly lose track of what day of the week it is. To try and manage this, we could try and keep some things the same as much as possible. For example, we could keep having our meals at a similar time each day, or keep out morning and night time routines the same. Kids often love structure and routine, so that can work well for them, too. For those of us in work, summer can be surprisingly busy. With lots of people being on annual leave, our workplaces can begin to feel a little empty. This can leave us with extra work to do to try and get everything done. It can also mean that there is less office chit chat so the work might not be broken up as much. We could have things to do but be unable to get them done because those we’re working with are away. We may also want to take some leave ourselves, which could mean that we put in more hours to finish all our jobs before we go. This can lead to longer hours and stress at work, which might mean we have less time to do the things we need to do at home, and less time to relax. This can all snowball into one big ball of stress. Prioritising important tasks and trying to stick to the hours that we’re contracted to work can help. If we work over our hours one day or week, it can be worth making a note of it so we can take the hours back the following week. We might not quite get everything done but it’s unlikely to be the end of the world. If we’re worried about it, we could try speaking to our line manager or colleagues to see if we could split some of the work. 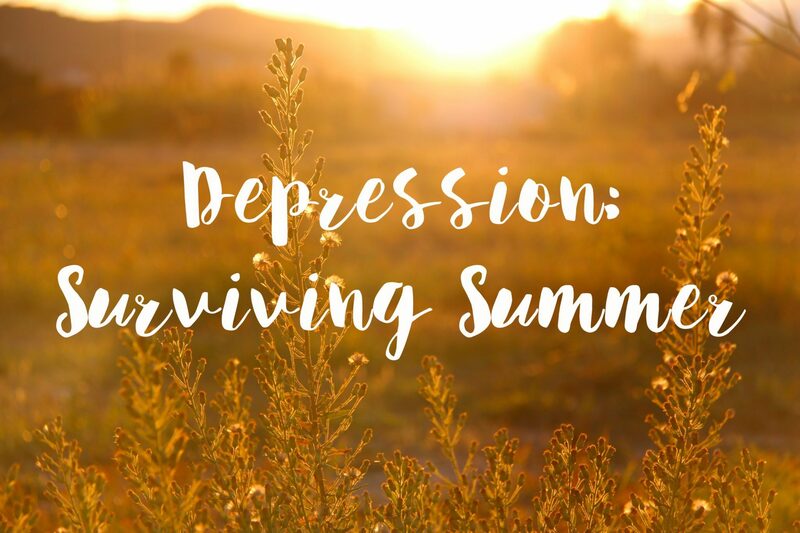 Money is often a worry for people with depression and summer can be expensive. Between holidays, days out, and the ice cream truck coming past our house daily, it’s very easy to spend money. If we have kids, they might need extra money for summer activities, and it can be especially hard to say no to them. This can be stressful, especially if money is tight. It might help to make a budget for each week so that we know how much money we have left for little extras. If we’re struggling we could try approaching Citizens Advice Bureau (CAB) for help. Over summer, many people go away. This might include staff members who have been supporting us. It could also include friends who give us a lot of support. This can be hard, especially with all the extra struggles that summer can bring. We need to make sure that we still have people to talk to when we need them. If we’re under a mental health team, we could ask our support worker about the support available to us over summer. There might be a mental health line we can tap into if we need support. If we see our GP regularly, we could make a summer plan with them – there might be another GP at the surgery that we can see if we need to. There are also a few crisis support lines who don’t take summer holidays.